Malou Fores is the proud proprietor of the diminutive but wildly popular restaurant called Mamou. At eight years old, she understood the joys and wonders of the kitchen after baking her first tray of chocolate brownies. Years later, married and raising her son, she would share her culinary passion with her family and friends, preparing casually intimate meals–which would eventually lead to the opening her current (and first) restaurant venture. 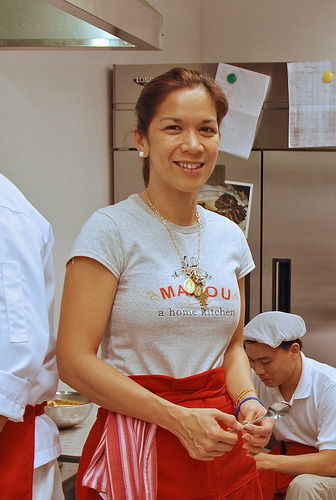 An avid badminton player, scuba diver and world traveler, Malou is always trying to improve the dining experience at Mamou with the hope of eventually expanding to other locations in Metro Manila. Who in your life has influenced your cooking the most? Tough question because there are quite a bit of them. For baking, it would be my sister, Annie. She was my first baking teacher. Professionally, I like Mario Batali and Tonyboy Escalante. My husband, I think. I really started cooking for him. Which book has had the biggest impact? Believe it or not, Paris in a Basket. I don’t have much French dishes on my menu but I would say Paris in a Basket inspires me because the pictures and recipes are very simple. It is uncomplicated French cuisine. Another book would be Mario Batali’s cookbook. What was your first job in the food business? I use to supply this quaint store at the old Magallanes Commercial Center named The Little Farm. I supplied them with my Mini Banana Loaf and Mini Kalamansi Loaf. How and when did you decide to open Mamou? As many know, I co-own Blue Kitchen. I have always been the food business–I’d say 14 years now. I would always have friends and family for dinner. Just home cooking, nothing fancy. No formal dinners. My friends would tell me, ”Malou, why don’t you open a restaurant? We don’t want to wait to be invited to your place.” My son was in high school and didn’t need my time. For me, I needed to keep myself busier from what I was doing already. I said maybe [I should open] my dream restaurant, where there are no rules. I would like to serve home cooking, the way I would cook at home. When I turned 40, [I said] I’m going to go for this. Because I know when I turn 50 or 60, I want to look back and say I did it. What is your favorite item on the menu of Mamou? It’s not on my menu yet, Sinigang na Baboy. I will be putting it on the menu soon. I don’t know how to plate it yet. I really love meat. I’m a carnivore. It’s very apparent [from my menu]. Which restaurant meal (foreign or local) do you remember the most? At Lupa in New York City, I had a pasta dish that I cannot forget, Bottarga with Chickpeas. In fact, I have recently added this to my menu and I believe this has become a favorite of some regular clients. Another meal was at Antonio’s in Tagaytay. Frozen Mojito for cocktails. Beef Tartare with toast to start, followed by Crispy Lamb Ribs, served with egg noodles topped with the freshest coriander leaves and a hoisin dressing. And for dessert, a scoop of Spicy Dark Chocolate Ice Cream. Besides your own place, what’s your favorite restaurant in Manila? Tonyboy Escalante’s restaurant, Antonio’s. Hands down. Chicharon from Cebu. It’s place in Cebu. I buy it in an outlet near the market. I love raw fish bagoong with kalamansi. I eat it with rice. Is there a food you just can’t seem to enjoy? No, I’m the type to try everything. [After some consideration] Yes, they are three: monkey brains, dog and horse meat. I’m hoping to open another Mamou, eventually. I’m still waiting for Rockwell. Maybe 2010. A restaurant with a ceiling [Mamou has an exposed ceiling]. I would like to work with somebody who is going to do a Filipino cookbook where we can travel the Philippines. Big Fan of Mamou. I hope Malou keeps doing what she does so well. please please please... please open in rockwell sooner than 2010 PLEASE, malou.. i really don't like serendra, sorry, or going to bonifacio.. if malou fores opens mamou in rockwell i promise to eat there at least 3 times (maybe more) a week! and yes, i love blue kitchen and i likewise am in her camp in her choice of best restaurant in manila - ANTONIO's (its not exactly in manila, but you know what i mean).. really hands down.. and tonyboy escalante is one of my favorite people and chefs as well, alongside malou fores! i read about her restaurant from market manila blog which gave it impressive reviews. no formal culinary training nor apprenticeship was noted which makes her accomplishment in the food biz quite impressive. either way, culinary school grad or not, i wish her more success in the field. Mamou ALWAYS satisfies. I just love the menu! please open a branch here in the Manila area - Robinsons Malate maybe.